A smart value the complete book plus three hours of video training! Windows 8. 1 brings some welcome tweaks to the Windows operating system, including more ways to customize the interface and boot operations, a new start button that reveals apps, greater integration between the two interfaces, and app updates. A smart value the complete book plus three hours of video training! Windows 8.1 brings some welcome tweaks to the Windows operating system, including more ways to customize the interface and boot operations, a new start button that reveals apps, greater integration between the two interfaces, and app updates. 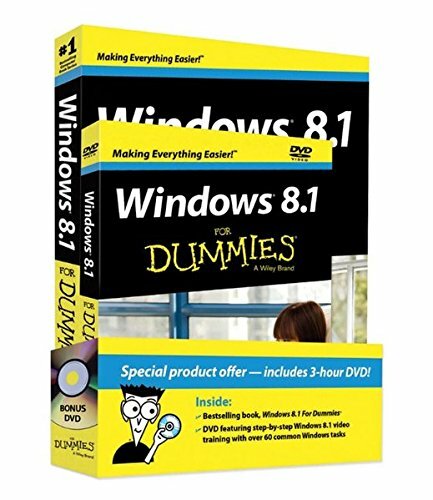 This bargain bundle includes the complete Windows 8.1 For Dummies book plus a DVD that walks you visually through the most common Windows tasks. Whether you're just getting started with Windows or are upgrading to 8.1, you can learn everything you need to know, see how things are done, and start using Windows 8.1 with confidence. * Includes the complete Windows 8.1 For Dummies plus three hours of video training on DVD * Covers all the upgrades that make up Window 8.1, including new opportunities to customize the interface, the new start button, and greater integration between the two interface options * Features complete information on using a Windows computer for those new to the system * The DVD provides basic overviews and step-by-step instruction covering the essentials of Windows 8.1 , such as getting started, using the start screen and the desktop, getting things done online, managing photos, playing music, customizing Windows, and much more Windows 8.1 For Dummies Book + DVD Bundle is a value-priced crash course for anyone wanting to understand and use Windows 8.1.